Happy birthday to me from my Boys! I’m not a big jewellery wearer, so I surprised the LSH when I told him I wanted a bracelet for my birthday. I made it simple for him – I did all the ordering myself. He didn’t have to do anything except say “Ok, that’s a good idea” when I explained what it was. …but that was the fault of the person who ordered it. Oops. 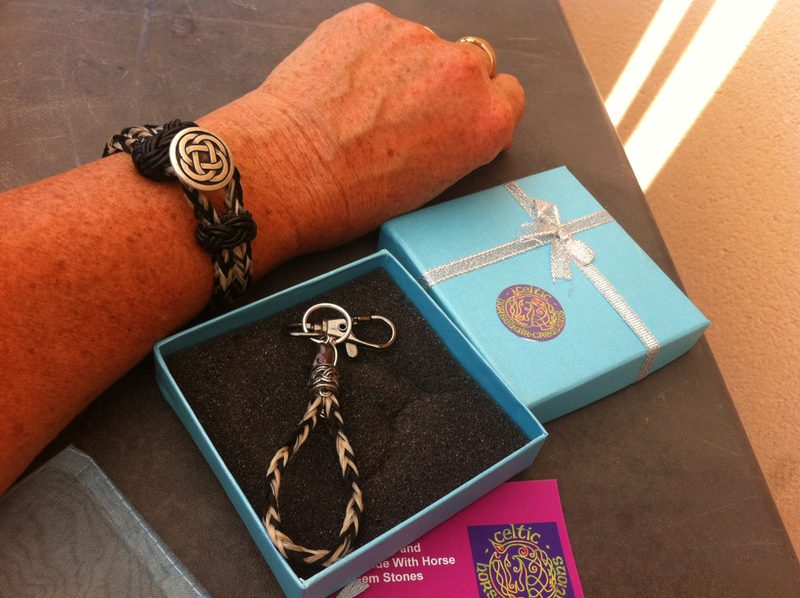 It came in a lovely little box, with an extra freebie included – a handbag charm. 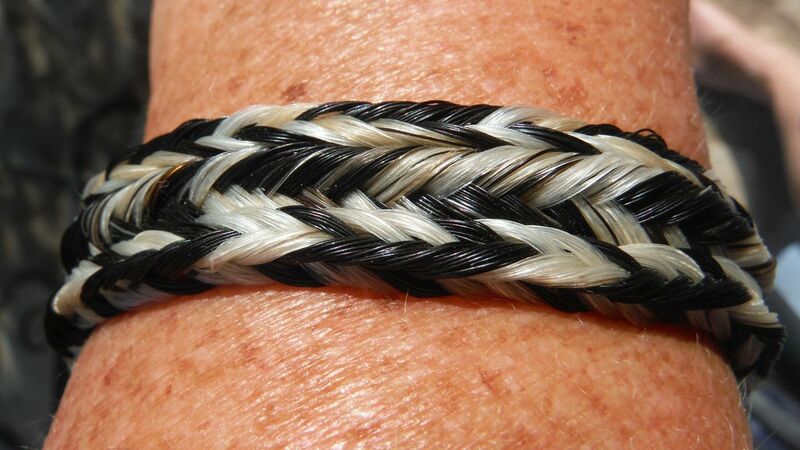 This bracelet is unique. It’s one of a kind. It’s made from a very special, highly sought-after, yet eminently renewable material. Yes, it’s made with Tails from Provence! Flurry and Aero donated a chunk of tail each and I sent them off to Kayti Aiken, aka Celtic Horsehair Creations. Kayti is one of the many on-line friends I’ve made since starting this blog. She started her own business making keepsake jewellery for horse owners about a year ago and I think it’s going well for her. I can certainly recommend it – the finish on both the bracelet and the charm is perfect, with no stray hairs sticking out anywhere and beautiful even braiding throughout. 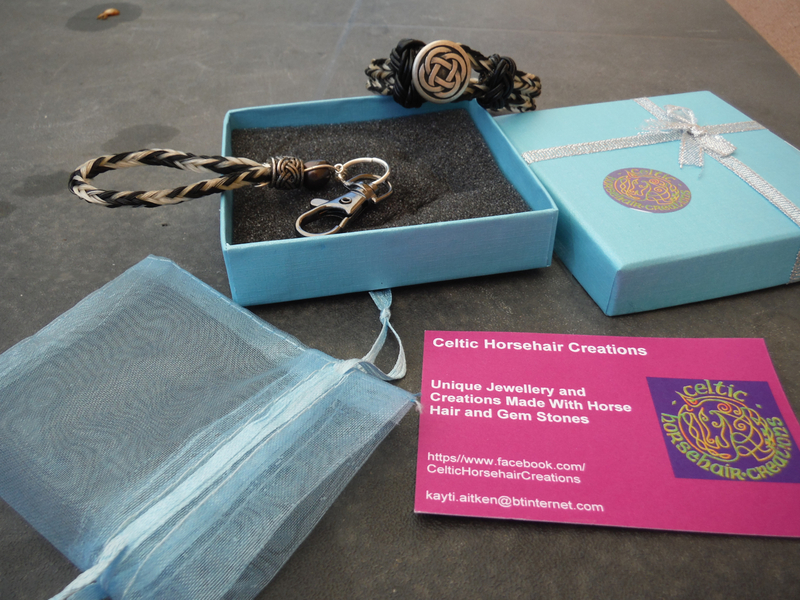 Her page is here : Celtic Horse Hair Creations Check it out – her prices are great considering how much work goes into each piece! 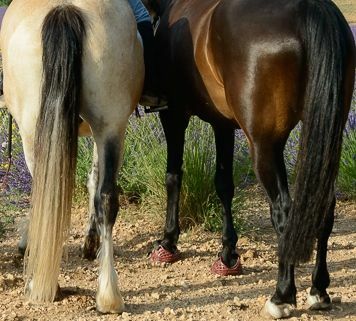 And yes, Flurry and Aero do have some tail left. Happy Birthday Martine! Love the bracelet. Since I have a birthday coming up this month I’m thinking the bracelet sounds like a great idea. My husband would like the whole gift idea too. It certainly would save him from coming up with something on his own. Very nice!! My hubby would love it if I took care of choosing & ordering my own gifts. It’s not a bad idea all round! I like to feel that Flurry and Aero helped to make it! !